These Perfect Dot night sights are awesome. 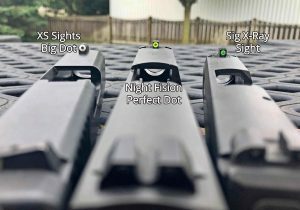 Do you need night sights on your everyday carry (EDC) gun? Well, you probably don't need anything besides food, water, and shelter to survive. And a new set of night sights isn't going to turn you into Jerry Miculek overnight. 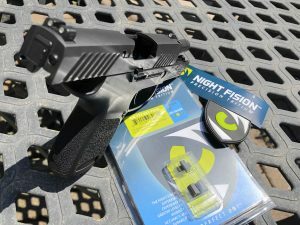 But these Perfect Dot sights from Night Fision are a great upgrade for your EDC. Whether it's an upgrade from the factory sights or another company's, these sights are legit. Self-illuminating sights- These sights use a radioactive element called Tritium that glows on its own. Tritium has a half-life of 12 years, which means after 12 years, that same Tritium will be 50% as bright as it was originally. Don't worry, Tritium is used in a number of everyday products and only poses any health concern if it is ingested or absorbed into the body. So as tempting as it may be, don't eat your night sights and you will be just fine. Photo-luminescent- These require a light source to ‘charge' them so they can glow. These glow brightly at first, then slowly lose their brightness and ultimately go dark after a few minutes. Fiber-optic- I will mention these to dispel any confusion. They are not actually night sights as they don't actually provide any of their own light. The fiber rod simply refracts ambient light to appear brighter. If there were no alternative, ‘charging' your night sights would be the only option. But because we have Tritium, I wonder why anyone would choose a set of photo-luminescent night sights. If you want a bright sight, you need more Tritium. 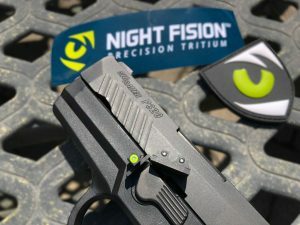 Night Fision claims to use 30% more Tritium in their sights than any other company. Are they brighter? Take a look at my XS Big dot, Sig X-Ray, and Night Fision sights side by side in complete darkness. Comparing the brightness of these sights in complete darkness. Again take a look at the same sights side by side. This time in the daylight. They all are prominent and grab the eye's attention, but the added durability of the Perfect Dot sights make them even more appealing. One thing appealing about the XS Sights Big Dot is that the front sight is so big. At least for a lot of shooters. While the Night Fision's dot is not as large, it is pretty darn close. Size is important, but the larger the front sight gets, the more difficult it becomes to be precise with your shots at a distance. So the size of this front sight dot may hit the sweet spot for users who want a big dot, but not very large. A prominent front sight dot is ideal for defensive handgun sights. Do you want a front sight color other than orange, green or white? Maybe you have some color blindness, compromised vision due to age or injury or some other reason why you prefer a specific contrasting color for your front sight. You can choose blue, red, orange, yellow, or white and all the colors are hi-visibility. Outside of personal preference, color probably won't matter too much. However, take this bit of trivia into account. As it gets darker and darker, the colors that our eyes can pick up starts to diminish. Essentially moving from color vision to more of a black, white, and gray. The last color on the spectrum that disappears in low light is green. This is why many hi-visibility, safety products have transitioned from bright orange to bright yellow/green. I chose this hi-visibility yellow color front sight for this reason. Will it help me shoot better? No only practice will do that. But, it is a color that I find is very easy to pick up across many different backdrops. 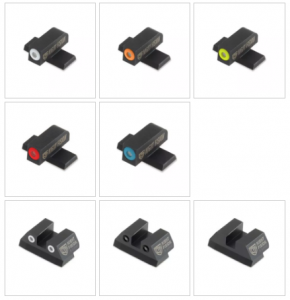 You can get a ‘perfect dot' in one of these colors, and choose what type of rear sight to pair it with. Night Fison produces a traditional square notch rear sight, as well as a “U” notch rear sight. Like front sight color, the shape of the notch is a personal preference, rather than something that will revolutionize your shooting fundamentals. But it is nice that they are forward-thinking enough to produce rear sights in both variants. Personally, I like the U shape rear notch. I find that the U shape gives you a bit more space in the rear notch to keep your front sight visible, without taking away what would be needed for combat precision. I am glad to see that the face of the rear sight is flat. My opinion is that for any rear sight to qualify as a good self-defense sight, it should have this flat face. In other words, the front face must be a 90-degree angle to the top of the slide. This just makes one-handed manipulation easier than one with a sloped angle. Will you ever have to rack your slide with one hand by catching the front sight on your belt, holster, or some other object? Hopefully not, but given the choice between a sloped rear sight, and a flat one, I know which one I would choose. The 90-degree angle on the rear sight makes it easier for one-handed manipulation. There are also varying opinions if the rear sight should have dots, or if it should be completely black. You can select a rear sight in a traditional 3-dot set up, where the two rear dots are Tritium filled and rather prominent. The other options are a rear sight with no dots at all, or a rear sight with two Tritium filled dots that are smaller and less prominent. Once again, personal preference here, but I don't like my eye being drawn to flashy rear sights. So I prefer either the blacked out or diminished dot rear sights. The ones I ordered have diminished dots. I find this gives me the reference points when I need them in low light or bright lights, but they aren't distracting to my eyes. The materials the sights are made from matters, especially if this is going on an EDC gun. These sights are made from 4140 steel. It may not seem like a big deal, but for an EDC gun that will be banged around and used in training, you want something that will last. If your sights get deformed simply dinging it on a barricade or from some hard training, get something else. You want to train with your gear, not be so worried that your gun or sights will break that you never push your limits. I have seen far too many sights made from cheap metal that get marred during basic installation. You can get these sights for Canik, Glock, Smith & Wesson, Sig, Springfield, and CZ. And don't worry if you have an optic on your gun, or are super cool and have a suppressor. You can get all these sights in suppressor-height. Tritium is a regulated commodity, and not just anyone can work with the stuff. Night Fision has been working with Tritium for 25 years as they produced the US Miltary's Tritium filled lensatic compass. So they know a thing or two on how to properly encapsulate Tritium so that it lasts. Upgrading from stock sights is a worthwhile investment. And finally, you're going to have to spend at least $100 on a good set of Tritium night sights, and some will set you back nearly $200 dollars. These Perfect Dot's are around $115 on the website, and given their durability and projected longevity, I would say that's a steal. As usual, full disclosure, I reached out to Night Fision because of all the praise I have heard surrounding their sights. They sent me a set of sights to evaluate in exchange for an honest (I wouldn't provide anything less) review. Overall I really like these sights and if you are looking for a sight upgrade, I don't know how you could go wrong with a set of these. Which sights do you trust on your gun? Let us know in the comments below.